In most cases you uninstall your local Exchange server after migrating your e-mail to Exchange Online. If you also choose to implement DirSync you place the administration in your local domain instead of the Office 365 Administration Portal. This means that there is no longer a GUI tool to handle some of the settings related to your mailboxes. Of course you can keep a machine with your old Exchange 2010 Management Console, but often the reason for moving to the cloud is to reduce the complexity and minimize the number of machines. We don’t have the same problem with other attributes, for example displayname or phone numbers that you’ll find in Users and Computers or the Administrative Center introduced in Windows Server 2008. It does get a bit trickier when you are about to modify primary email address or add alias addresses. Currently there are no available GUI tools from Microsoft to handle these types of updates easy (but keep your eyes open, things might change 😉 ). However, there are a few third-party tools to achieve this, unless you want to use the Attribute Editor in Users and Computers, or Adsiedit. Since I’m a big fan of PowerShell I wanted to build a small set of tools to handle simple changes of email addresses. These functions are easy for you to use in your own scripts. Displays all email addresses assigned to a user. Adds an alias address to a user. The type of address. Default is smtp. #New default address to set. Start by removing the old one, but keep it as alias. Removes an alias address from a user. Write-Warning "New default address set: $newdefaultaddress"
I have put together a PowerShell Module for you to import. Just load it with the Import-Module cmdlet. The module can be downloaded here. I hope that you will find these functions useful in your daily user administration tasks. Please leave your comments below and feel free to suggest improvements. This entry was posted in Active Directory, Exchange Online, Office 365, PowerShell and tagged alias, dirsync, powershell, proxyaddress, user administration on January 7, 2014 by Andreas Lindahl. Are there prerequisites that must be meet before running the script successfully? Hi, as seen in the beginning of each script, you need to run it on a machine that have the ActiveDirectory PowerShell module. Let me ask another way. If that specific module is already installed (as it seems to be by default) and the script command “get-o365aliasaddress ” is run from an Exchange 2010 server (or dirsync server) hosted on Windows 2008 R2, how does one avoid getting “unable to connect to server” or “unable to find default server with active directory web services running” as the results? Hi. The script uses the Set-ADUser cmdlet, which requires a Windows Server 2008 R2 Domain Controller or newer. Okay. So the prerequisite is a Windows 2008 R2 or newer domain controller. Thank you. That helps a lot. Thanks for the script… I have been looking for a way to make this easier for my lower-level admins. This will definitely help. I was planning to try to wrap something like this up in a GUI. Any chance of something like that showing up? Thanks for this, its very useful. A GUI wrapper would be really handy too – just asking! I have made a small function to this that I thought I would share. It is a simple function that reads each line in a .txt file containing my company’s domains and pipes that into a foreach loop, this way I only have to run one command to add all the default addresses that we normaly add to a new user. I am not sure if this is the best way to go about doing this, but I am just starting out learning Powershell and it works for me. 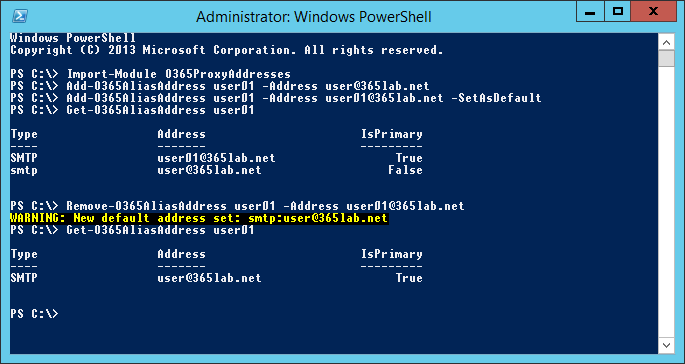 Remember that the first line/domaine in the file will be the primary SMTP address by the “Add-O365AliasAddress” command, unless the user already have an SMTP address, in which case you must do this manually if needed. # Get files from default file, and pipe it down an foreach loop that takes each line one at a tilme. Write-Verbose  "Calling Add-O365ProxyAddress as Identity $Identity and an address of $address "
Thanks for sharing! Always good to hear that our blog posts are helpful to you. I made a GUI for this mate to make it easier for some of my clients who are less good at scripting. Just extract all to somewhere (with powershell 3, .net 4 and admin tools installed) then run the “O365 email address management gui.ps1” file. You will also need to set your execution policy to allow it to run. The GUI stuff was borrowed from here http://blogs.technet.com/b/heyscriptingguy/archive/2014/08/01/i-39-ve-got-a-powershell-secret-adding-a-gui-to-scripts.aspx if anyone wants to have a go or improve my design. Also there is a try, catch in there for wrong usernames, this will stop it showing error messages if its not running right comment out the try and catch lines then try again. Hope its of use to someone. Hi Steve, Sorry I didnt get an email to say there was a reply. you might need to set the execution policy for powershell to allow unsigned scripts, run (as administrator in powershell) Set-ExecutionPolicy unrestricted then try again. Do so at own risk etc etc etc. I hope this helps someone else who may have the same problem.